The cultivation of Bonsai, inclusive of soil, watering, pruning, fertilizing and nutrients. Bougainvillea: From climber to Bonsai, first steps. A friend of mine is going to make alterations to his house which includes demolishing the garage. As my luck would have it, a relatively old Bougainvillea climber is growing on the side of the building and it was going to end up at the dump when building starts. I kindly offered to remove the plant for him. So today was the day, overcast with the odd light rain falling. Perfect conditions for the operation. The first part of the job was to take the plant down to stump level. This took about an hour as this Bougainvillea had a lot of quite large thorns. Once that was done, the stump was wiggled and I found that it had two large roots going to either side of the plant. One of the surprises was that the wood is quite soft and this extended to the roots. The spade went right through a two-inch thick root with one go at it. One of the roots grew underneath the building and as it was quite close to the building, I decided to pull the stump over to the front. On the one hand this was a mistake as the large root tore in two which left it with quite a large wound (was going to have one anyway due to the cut), but on the other hand, it left me with a smaller plant now separated from the larger stump. Not bad, two plants for the price of one dig. I quickly cleared the area up and did not wrap the roots as I would normally do as it was a ten-minute drive to get home. At home, the two plants were placed in a bucket with water in which I dissolved some aspirin. Aspirin has the same active ingredient that is found in willow bark and this is said to be supporting root growth stimulation, just like hormone rooting powder. From here I prepared two pots by adding drainage material (stones) at the bottom and then filled the rest with 1 part compost and two parts pumice. I also shortened the larger stump. More rooting hormone powder was applied, planted, watered and placed in a good, protected spot. The good old human attribute of patience will be applied while we await the outcome. I prefer to wire and shape trees in three stages. The first stage involves the trunk and larger branches. The second phase incorporates the secondary branches and the third is the fine wiring and placement of tertiary and finely developed, ramified branches / twigs with leaves or needles. Each phase lasts a minimum of a year and includes at least one growing season. This video shows some intermediate wiring. Why? I do find that this way produces a better, more refined product and it gives the tree more time to adjust and recover from harsh bends. My gut instinct tells me that it might also be better for sap flow in especially Junipers compared to trees that undergo a full wiring, bending, cutting and sometimes even a full repot in one session. I do hope that this last scenario is not a common thing. I might have to change this as I now live in a warmer climate with a longer growing season. Time and attention to growth patterns will tell. Pine Seedlings as Cuttings – Early work to get a killer Nebari. 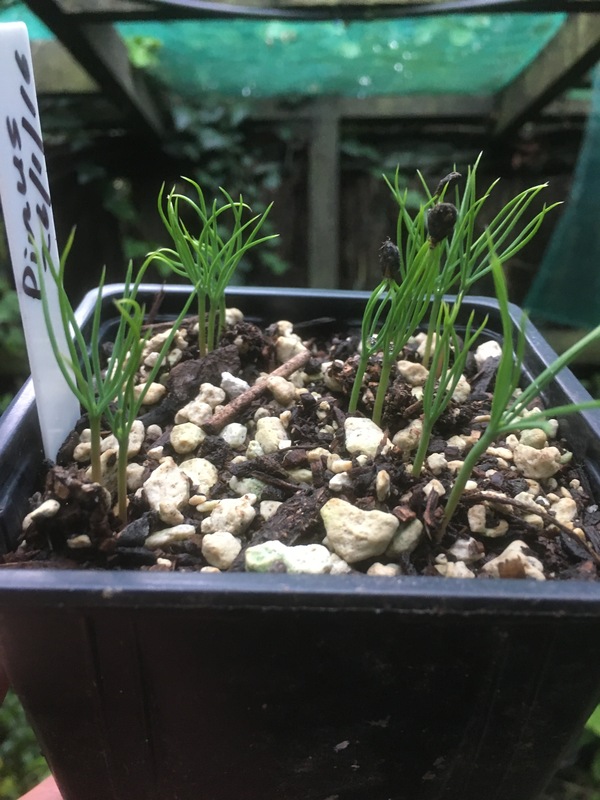 In an earlier post (https://wordpress.com/post/bonsaiplace.net/515), I have written about the germination of Pine seedlings. These seeds (planted on 26 January 2016) germinated very fast and are now large enough to change into cuttings. The reason why I do this is that it gets rid of the tap root early on and forces the seedling to grow new roots and the hope is that the new roots will develop radially for a really great nebari. That is theory. I started off by making sure that I have all the tools needed to start the process. This included containers with seedling mix, a surgical blade, hormone rooting liquid as well as my trusty Rhizotonic. The first step is to wet the seedling mix in the container with the Rhizotonic solution. Rhizotonic is a dynamic, organic root stimulator and stress reliever (wonder whether it works for humans?). I use it for everything that is re-potted, yamadori that are planted and especially for plants where a lot of roots have to be cut. The next step is to very gently remove the seedlings from the original container. This phase needs to be accurate and quick as the seedlings cannot dry out during this time. The seedlings are placed on a cutting board and the tap roots are removed by cutting through the seedling where the stem and taproot meets. It is important that a very sharp blade is used as the stem cannot be bruised or crushed at this stage. The seedlings are then handled by the leaves to further prevent bruising to the stem and it is placed in the rooting hormone. From here the seedlings are quickly planted in the seed raising soil. The seedlings are now watered in with the Rhizotonic solution and placed in a shady, but warm location. From here the seedlings will be sprayed with the Rhizotonic solution twice a day and if necessary even three times a day. Now the wait begins. The date today is 20 March 2016. Tanuki – Cheating or Design Technique? driftwood style. It goes further to state that the deadwood usually has the form of a weathered tree trunk. The tree is attached to the deadwood by making use of screws, clamps or wire. Over time, the tree will grow into the channels created and in so doing will disguise the fact that it is a separate entity. In Japanese folklore, Tanuki, the Japanese raccoon-dog. are shape-changing tricksters. It is also known as Phoenix-grafts in the West. Personally, I think it is a good artistic technique to either enhance a piece of deadwood or a tree. There is no difference in attaching a tree to a rock compared to attaching a tree to a piece of deadwood. I had to try my hand at this. My experience is written up below. I first had to find the right tree. I decided on a young Juniper with a lot of flexibility. The next project was to find a suitable, characterful piece of deadwood. I managed to get a piece on the beach. A note of warning is needed here. If driftwood from a beach is used, it is important to get rid of all salt on and in the wood. I submersed the wood for three weeks in fresh water and regularly changed the water as well as used a high pressure stream of water and scrubbing on it. It was then left in the sun for another week. The third component was a pot selected from my pot collection. 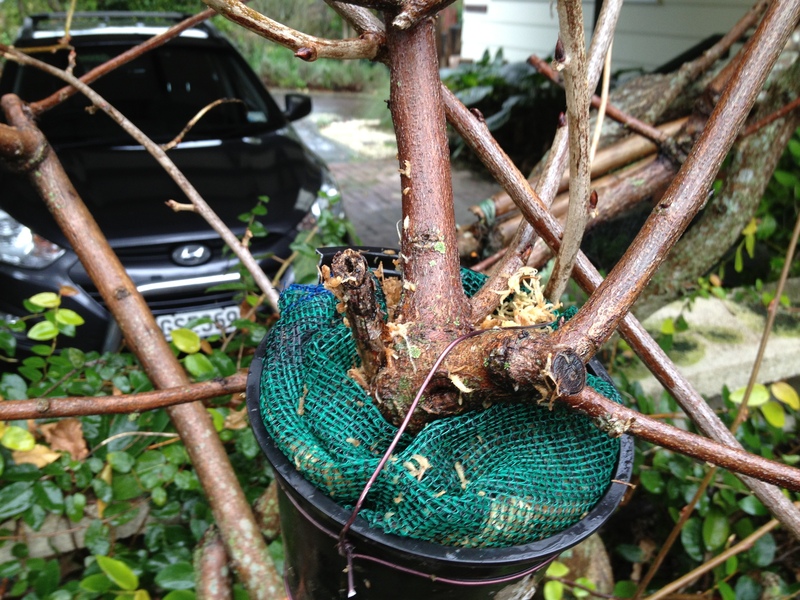 The first job on the pot was to get enough tie wires in place as the deadwood and tree must be secured very firmly. It is wise to get a hardener on the deadwood. I treated it with lime sulphur as the bottom part will be in the wet soil. I have read that the end could also be placed on a solid object like a tile to minimise the part in contact with the soil. My first challenge was to drill extra holes in the pot. For the first time in my life, I had a pot which is so hard, that the drill bit did not even make an indentation on the pot. The tie wires therefore had to be attached through the drainage holes. 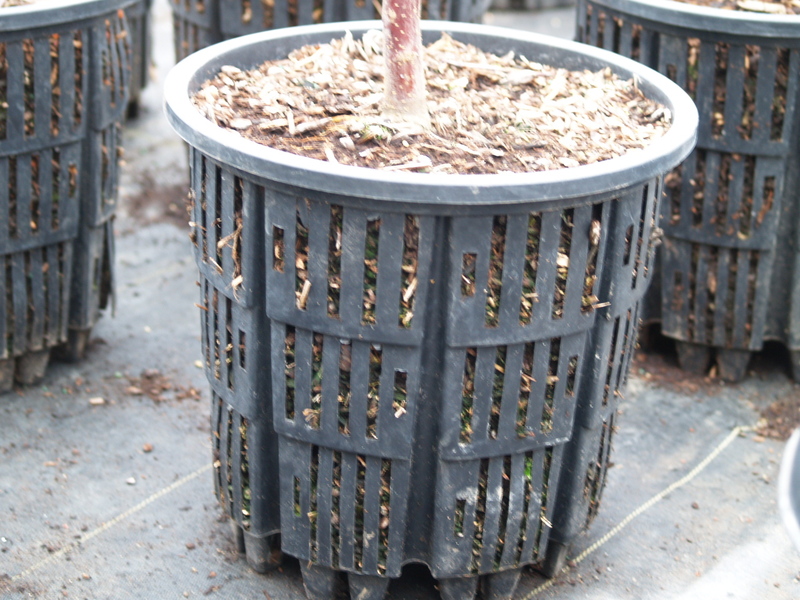 The next phase was to ensure a flat structure at the bottom of the deadwood to make it stand more solidly in the pot. This was done by simply determining the angle, marking the wood and using a handsaw to make the cut. Next I had to drill holes into the deadwood for the tie wires. Advice found was to use a router to create channels in the deadwood. This was not necessary on this piece as it had natural channels that could be used for the tree to be placed in snugly. The tree was now prepared by preparing the roots and cleaning up the trunk. It was put in place starting at the bottom and fixing it to the deadwood with non-reacting (copper) thin screws. I pre-drilled the tiny holes as the tree is very thin in places and did not want it to split. Branches which came in the way of this process were removed. I decided to leave the growth at the top as is as I did not want to stunt the growth too much at this stage. The whole idea is that the trunk fattens up to secure itself into the channels and adhere to the deadwood. Branches were wired and now the maintenance work of feeding and watering begins. No pruning will take place until the two entities become one (hopefully). Cheating or a legitimate technique? You decide! I found a reference on bonsainut.com that mentioned that Masahiko Kimura designed Tanuki and it also mentioned that John Naka once threw one out of a display and told the owner to go and get a real Bonsai. I will update this post as the Tanuki showed here progresses. During a conversation with Noel Plowman at the National Bonsai Convention and Show in New Zealand towards the end of 2015, Noel made the statement that it is hard to get good Pine genetic material in New Zealand. Most of the seedlings propagated for the forestry industry is genetically engineered to grow straight trunks with no bark. Both of these factors are not really what Bonsai growers want. We then talked about the thousands of very old Pine trees all over New Zealand, mostly growing on farmland. The photo below shows such a scene, complete with good old New Zealand dairy cows. This made me look at these trees in a different light and it did not take me long to go and scavenge on a farm (with the farmers permission) to find these original genetic material in seeds for propagation purposes. This I did knowing full well that I am germinating these seeds for the next generation and not myself. The main idea was to collect the cones from trees that show thick bark. Cones collected, the next job was to get the seeds out of the cones. This basically ended up being a good solid shake of the cone and the seeds fell out. Quite a few seeds were harvested from each cone. The wings were removed from the seeds. The next step was to find the viable seed. This is done by placing the seeds in a container with water. The seeds that sink are more viable and the ones that float, are discarded. Top view of the seeds after placed in the water. The sunken seeds are shown. I left the seeds overnight and planted the viable seeds the following day. The seeds do have a pointy end and the seed is planted with this pointy end facing downwards. Now the long wait begins as it is known that these seeds can take a long time to germinate and that they do so in a haphazard way. I will update this post as the process unfolds. Planted and labelled. The long waiting game now starts. The waiting is over. This was quick. Only three weeks from planting to germination. Metrosidorus excelsa, also known as the New Zealand Christmas tree and in Maori, Pohutukawa, is an interesting tree to style as Bonsai. This looks like two smaller trees, simulating a clump style Bonsai. I have recently had the opportunity to photograph a few very old Pohutukawa trees in Mt Maunganui in New Zealand. I have no idea how old they are, but their form is quite distinctive when you study the trees in nature. From this I came to the conclusion that they are best suited for informal upright, clump style or root over rock style. They naturally grow aerial roots and form good bark on exposed roots. The red coloured flowers add to the spectacle. The three Bonsai photos are mainly from the http://www.nzbonsai.co.nz website and the http://www.bonsaiforbeginners.com site. 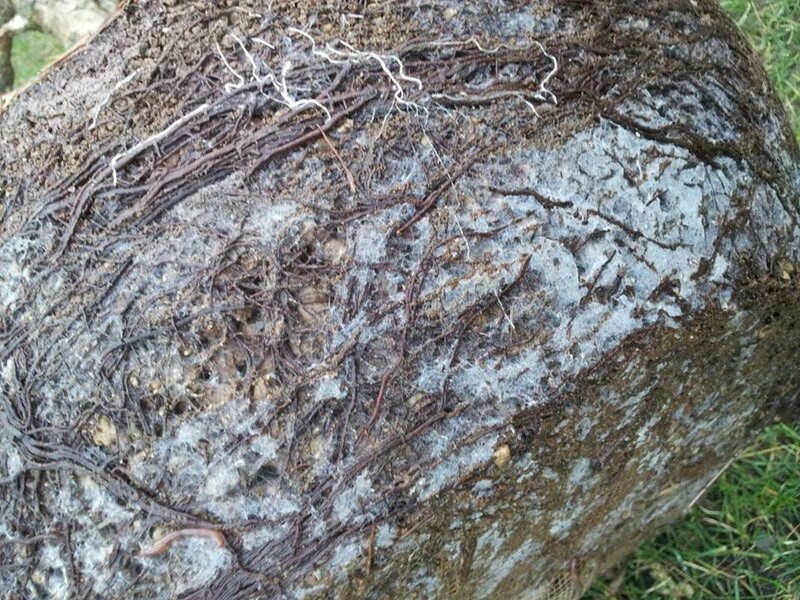 Masses of aerial roots makes it perfect for a root over rock style. 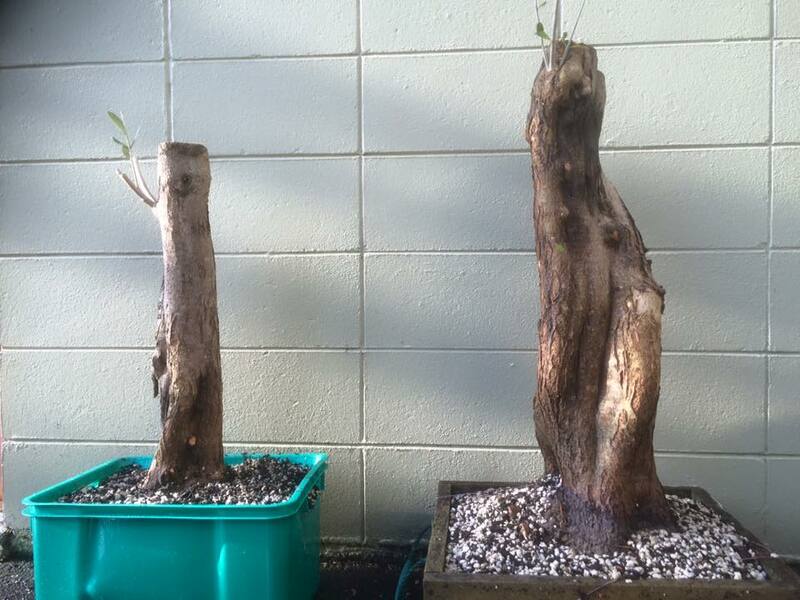 The photos following from there are the photos of the trees growing in Mt Maunganui, New Zealand. The first group is typical of the clump style growth that a lot of these trees show. 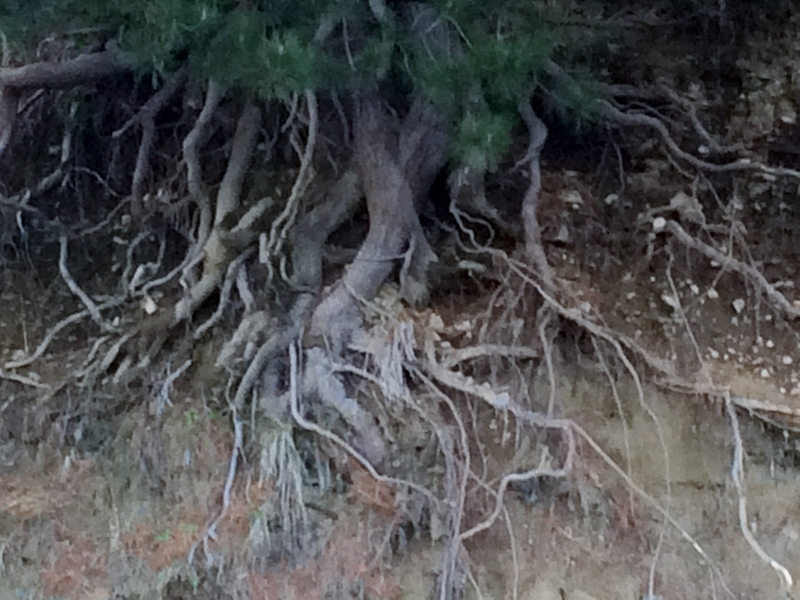 The next group of trees shows why I think the Pohutukawa is excellent material for root over rock style. Some of these trees are also seen in nature as examples of an informal upright style. I have also noticed some branches hanging very low, almost to the point of being a cascade or a semi-cascade. I have been growing cuttings of another form of Meterosidorus, namely the Metrosideros kermadecensis. This tree has smaller leaves than the excelsa which is great for Bonsai. All these varieties are frost sensitive and needs protection in cold climates. My latest one man show collecting a Juniper Yamadori. 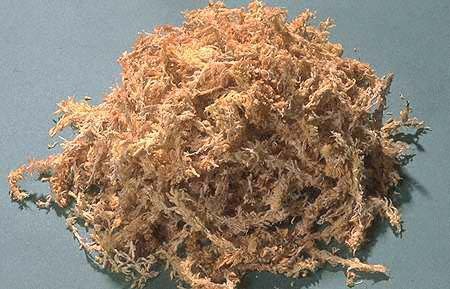 Sphagnum moss is used in a variety of ways in conjunction with growing Bonsai. The main characteristic of Sphagnum that makes it useful to Bonsai growing is its ability to hold a lot of water. Sphagnum moss plants can hold 16–26 times as much water as their dry weight. Sphagnum also does not decay easily as it contains phenolic compounds in its cell walls. It therefore can be used in applications that can take a long time to complete. It does not break down as easily as other growing mediums. Sphagnum originating from peat bogs is known to aid in preservation of substances due to the phenols, but also due to the fact that it grows in an anaerobic environment. Less oxygen means less decay. It is a well-known fact that bones and the remains of living organisms that end up in peat bogs tend to be quite well-preserved after a long period of time. These mosses can also acidify its surroundings. This is something to keep in mind when the moss is used as a growing medium or part of a growing medium. It is therefore advised that sphagnum moss is not used with plants that prefer a more alkaline environment. It is also a natural antiseptic. Sphagnum Moss was used extensively during the World Wars in field dressings to pack out wounds and under bandages to keep wounds clean. Harvesting these mosses is hard work. It also comes from areas that could be ecologically very sensitive. 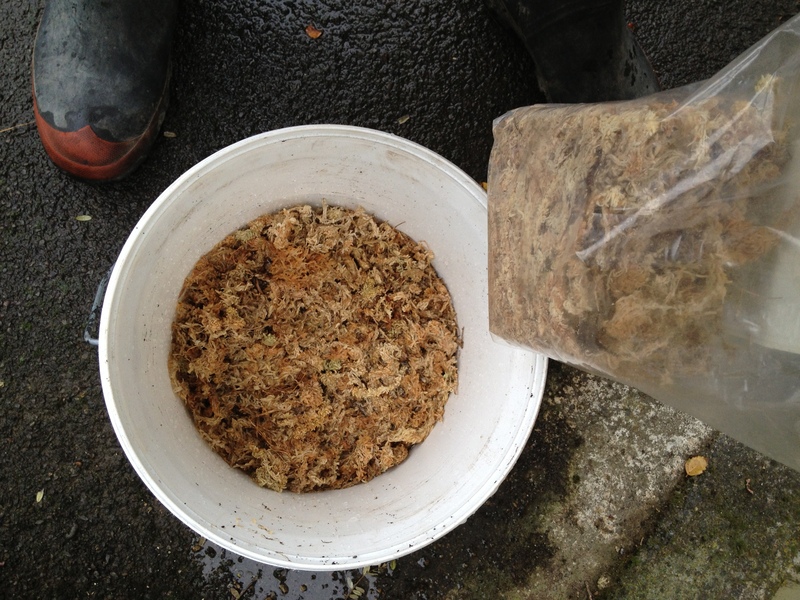 These facts can contribute to the fact that good quality sphagnum moss can be quite costly. There are environmental concerns about the sustainability of moss harvesting. In Bonsai cultivation, Sphagnum moss is mostly used in conjunction with roots and root growing. It is a well-known fact that when trees are harvested from nature (Yamadori) that it is a good idea to pack wet sphagnum moss amongst the roots. The reason for this is obvious due to the water holding abilities of the moss. During a recent dig, I not only packed the moss amongst the roots, but also wrapped it in hessian before it went into a plastic bag for the trip home. This not only held the moss in place, but aided in keeping the moisture in. I am also at the moment experimenting with two similar trees, one with Sphagnum in the soil mix and the other with normal soil mix. The question to be answered is whether the one shows more and better root growth than the other one. More on the results in a future blog. Sphagnum moss is also used for air-layering. Again the moss is tightly packed around the wound created for the purpose of providing a medium for root growth. The water-holding capacity is again the main reason for using the moss. In this case it also helps to allow air flow through the medium which will aid in root growth as well. 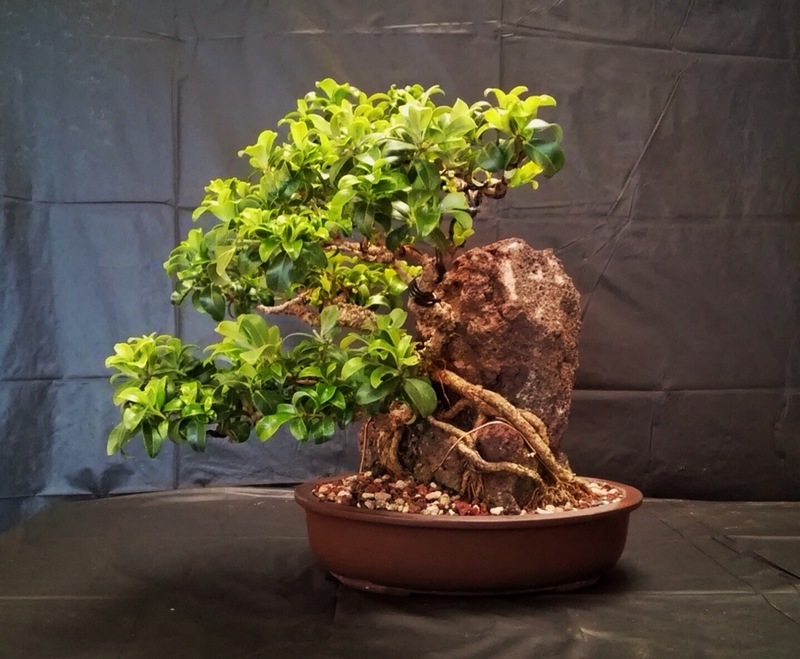 It pays to know something about the anatomy and physiology of roots when it comes to developing the root system of Bonsai trees. It is said that a tree mimics its above ground growth to what happens with root growth below ground level. This might be true for trees in nature, but with Bonsai it could be quite different due to the fact that we prune the roots and the roots also have to grow in a confined space. 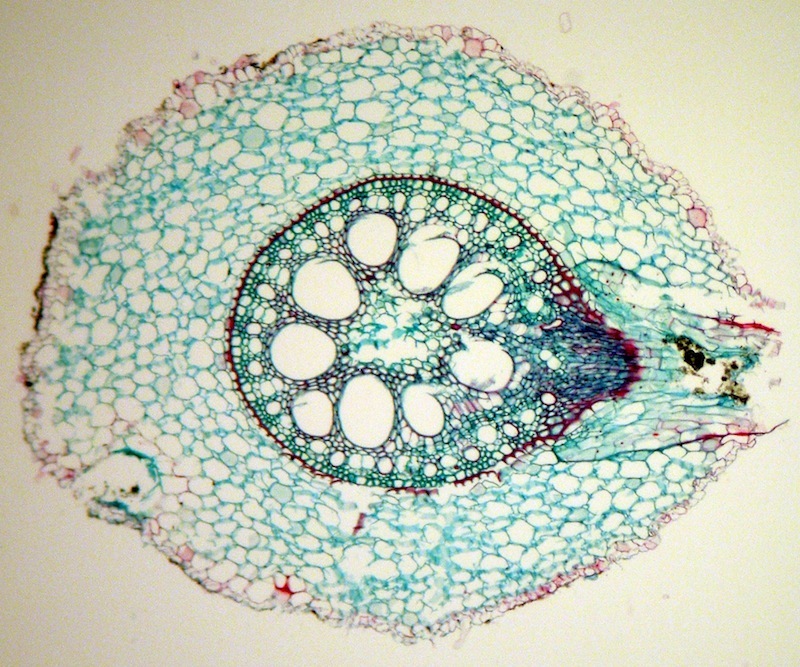 When a root is studied under a microscope it is clear that there are different tissue types present in different areas of the root. On the outside is an epidermis layer consisting of cells. To increase the surface area, and therefore the absorptive area of the root, extensions of these epidermal cells grow into the soil. These are the root hairs. The main job of the root hairs is to absorb water and nutrients. They are very small and fragile and normally breaks off when a plant is pulled from the soil. This is a very good reason to be gentle when a plant is uprooted and when soil is removed from the roots. The next layer under the epidermis is the cortex. These cells are loosely spaced to allow for the movement of gasses and dissolved nutrients to the core of the root. 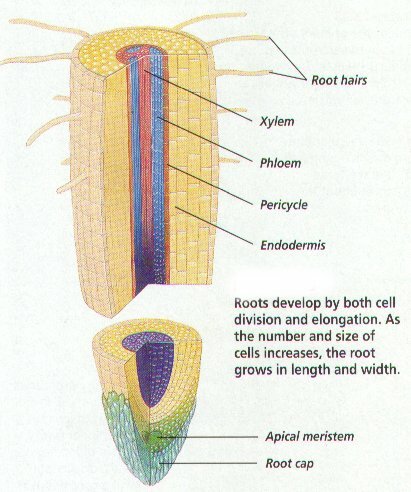 The middle part (core or stele) of the root consists of the vascular tissues, the xylem and the phloem. The xylem particularly is of importance here as it is through this tissue that the water and nutrients are transported to the rest of the plant. Around the vascular tissue is another layer of cells, called the endodermis and underneath this is the pericycle. Lateral root growing from the pericycle. This pericycle is of particular importance to the plant and Bonsai artists as this is where lateral roots originate from. The origin of the lateral roots is therefore situated deep inside the root structure and not like the branches or side shoots of the plant that originates from adventitious buds. The only reason for this that I can think of is that it provides better protection for the roots. It also means that the vascular tissue is in close contact with the lateral root. Apply rooting hormone to the cut roots. If the root is studied externally the branching of roots can be seen as starting a little bit further back up the root and not right from the root tip. The same mechanism that applies to pruning above ground is also evident here. When the apical meristem (in the root tip) is removed, the pericycle is stimulated to grow more roots. This is also due to the influence or the lack of this influence, of plant hormones. This is the science behind root pruning. When a root is pruned, more roots will grow from that area. It will help if rooting hormone is applied to the cut area as this will help to stimulate the pericycle to produce more roots. Ensure that the rooting hormone is applied evenly for an even spread of new roots. There is some evidence that when the rooting hormone is applied to only one side of a root, that more new roots will grow on that side. I will experiment with this and report back on findings. 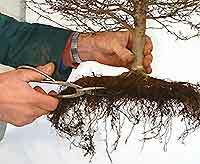 The term air pruning has also been used in the propagation of plants. This method can be used for Bonsai as well, especially during the early phases of development where the emphasis is on the development of branches as well as the root system. It simply means planting the tree in a container with holes in it. The roots will grow to the edge of the container and either split or not grow any further. It was mentioned earlier that the removal of the root tip (apical meristem) will stimulate the pericycle to grow more roots. This is also true when the apical meristem is damaged. Growing the tree in a soil medium with lots of granular particles can cause the root tip to split or damage it and this will in turn stimulate more lateral roots to grow. 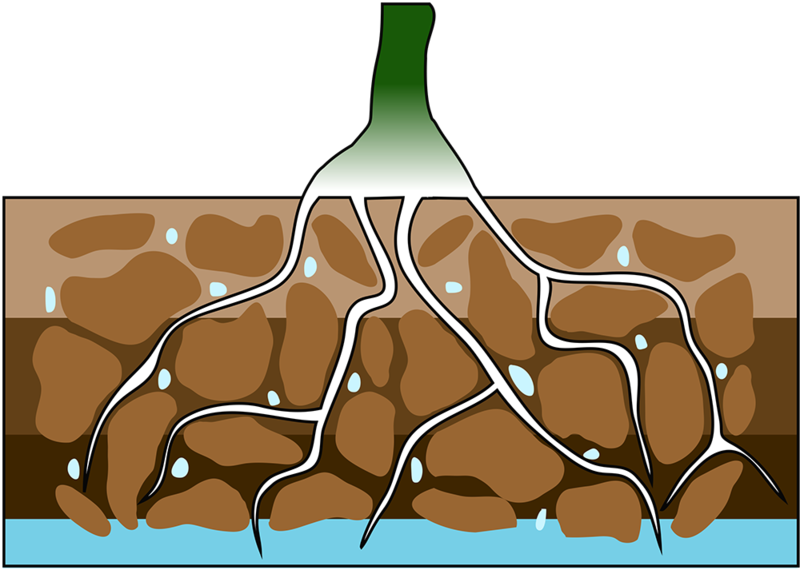 Also of note here is that the majority of water and nutrients are absorbed through the root hairs. As these are usually in the vicinity of the root tip (directly behind it), it can be taken for granted that these root hairs will be removed or reduced when root pruning. The uptake of water and nutrients will therefore be compromised when root pruning takes place. Be vigilant. This is the reason why the tree should be watered well and placed in the shade after root pruning. Water loss through transpiration must be avoided. Factors that increase transpiration are heat, wind and leaf surface area. It is therefore a good idea to reduce the leaves after root pruning in the case of deciduous trees. This might be another reason for re-potting and root pruning in spring before the leaves are fully grown. As roots age, they undergo secondary growth or secondary thickening. This is basically when the softer tissue becomes woody and bark is formed. This happens faster with exposed roots. The main thing to remember here is that older roots that have gone through this process will not absorb water and nutrients. When root pruning, this needs to be taken into consideration. Always leave some of the younger, finer roots to provide the plant with water and nutrients. The white threads are Michorrizal fungi. Mycorrhizal fungi occurs naturally in soil. They form a close symbiotic relationship with plant roots. They are called mycorrhizae ,from the Greek “mukés”, meaning fungus, and “rhiza,” meaning roots. Mycorrhizae are considered to be in a mutualistic relationship because both organisms benefit. The fungus receives the products of photosynthesis from the plant and is therefore does not need to find its own sources of energy. At the same time the fungus grows out into the soil and retrieves nutrients, especially phosphorus and nitrogen, and passes these back to the plant. It is usually seen as a network a very thin, white threads spread throughout the soil in close contact with roots. The root on the right has the fungus in close contact to enhance the absorptive area of the root. This means more nutrients and water can be absorbed than the root on the left. However, in most soils that have been disturbed by residential construction, or intensive cropping practices with applications of fertilizers containing pesticides and other chemical products, the mycorrhizae content has considerably diminished, and has become insufficient to significantly enhance plant growth. Numerous experiments have shown that plants without mycorrhizae cannot cope as well with low mineral levels as those that have mycorrhizae. In a Bonsai pot, the soil is a very controlled environment. The Bonsai artist determines what goes into the soil, what it consists of and how much water is given. When mycorrhizal fungi colonize the plant’s root system, they create a network that increases the plant’s capacity to absorb more water and nutrients such as phosphorus, copper and zinc. This process in turn enhances growth and favors rapid development of roots and plants. 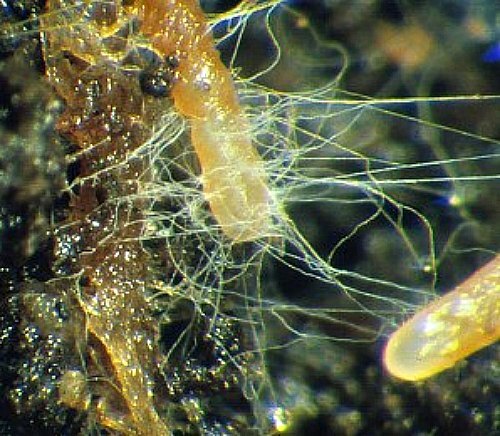 Where this fungus is present in soil, a much faster establishment rate of new roots is observed as well as a reduced water need of up to 30%. The reason for this is that the micorrhizae ensures a much larger surface area is available for the absorption of water and nutrients. The plants are healthier and grow faster. There is also evidence that these fungi can also improve the structure of the soil. The threads grow through the growing medium and aggregates the soil. This allows for more air to move through the soil as well as enhancing drainage. Back to Bonsai cultivation. As mentioned before, the soil in a Bonsai pot can be very sterile as it could consist of particles that do not necessarily contain living organisms or lots of organic matter. These could include valuable soil bacteria (nitrogen fixing bacteria) as well as michorrizal fungus. In the absence of these, it is important that the Bonsai artist allows for mo re (more frequent) fertilization to take place. Michorrizal fungus spores can be bought (I have not seen it in New Zealand yet), but a much less expensive way to inoculate your Bonsai soil with the spores is to use a bit of the original soil in the Bonsai pot at planting time. I find that this is especially important when I plant Pines and other conifers. In summary: Most plants in nature live in a relationship with Micorrhizal fungi. Both organisms benefit from this relationship. Most Bonsai soils will not contain this fungus and by adding the fungus to Bonsai soil, the plant will establish faster, take up more nutrients and will need less water. Something to think about when it comes to transplanting time.